Listen NOW to the Eurovision #ESC250 most voted songs by you! Today at 11am CET our friends at 12Points.tv and ESC Radio begin the countdown of the Top 250 Eurovision songs as voted on by you The Public. Will Conchita make it to number 1 or will Loreen be Euphoric or will they all have their Waterloo as Abba takes the #1 place. Here are the Facts that we do know! Twenty two songs from 2014 – but who? 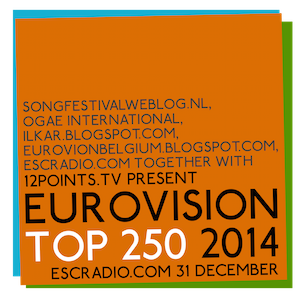 Follow #ESC250 on Twitter (hoping to be Trending Topic again, like last year!! Tune in to see where your favourites have come in the all important chart – and a great day of listening to Eurovision songs old and new.